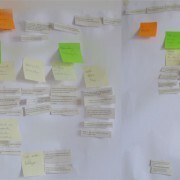 A colleague and I organized a small barcamp-like meetup for qualitative researchers at the Bauhaus University Weimar. We met on the 21st of May 2015 at the neudeli, the Bauhaus University’s startup incubator (»Gründerwerkstatt«). A collection of free-as-in-freedom resources for user research. Each resource has a brief description, a source and the license. However, to be sure you should look up the license on the source (this is what matters). I had only a brief section on analysis. It was fairly conventional: search for patterns and list them as text. In a previous blogpost I demonstrated some methods for mapping social relations as well as emotions/liked-and-less-liked-parts-of-a-process. 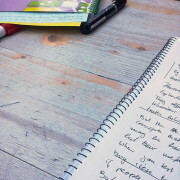 In this blogpost, I will show some ideas on documenting the processes with your participants by writing step-by-step instructions together. I think that teaching-by-examples is an awesome and empowering method. Instead of a universal principle given by some authority a way to solve a problem is suggested.